If you’re a guy, and you’re reading this, you know that us guys like talking about beer almost as much as we like drinking it (almost!). And you also know that our lives are not really fulfilled unless we have someone to share our beer conversations with. Kind of like when Ken tells Barbie in Toy Story 3 that the only thing he’s missing is someone to share his dream house with…well, that’s REALLY what we boys like (apologies to The Waitresses). Well, we think that Daniel Drennon has nailed it right on the foamy head with his LA Weekly blog post, “5 Things Women Need to Know About Beer.” One thing that Daniel has figured out, and figured out well, is that we guys are easy to impress, as he points out in Point No. 2, “Knowledge of Beer Is the Easiest Way to Impress a Dude.” Amen to that, Daniel, my brother. 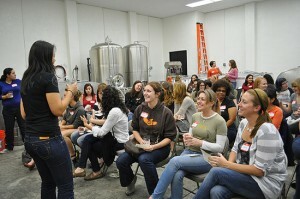 This entry was posted in Uncategorized and tagged ale, amber ale, american beer, beer, beer events, beer tastings, lager by weblogbeers. Bookmark the permalink.